It can't be more satisfying than seeing Bermuda's turquoise waters, beautiful pink sandy beaches, the coastline, secluded reefs and other great attractions from the sky. One way to experience this is through parasailing. There are several parasail operators who run their operations both from the Dockyard in Sandys and St. George's water areas. Some have sit down type chairs and others with secured harness type arrangements. You won't even touch the waters unless you request for a dip while landing. They will launch you from the boat and retrieve you back into the boat. The boat usually takes several persons together and you will need to wait for your turn. While the total time taken can be between 60 to 90 minutes depending on the group size, the time spent flying would be about 10 minutes per person. 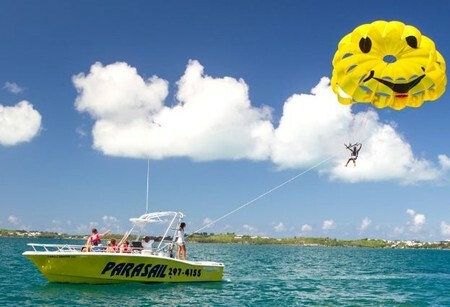 Parasailing in Bermuda is perfect for families and children. You don't require any experience or training. All the operators have experienced guides who control the entire operation. Some of them also allow two persons to parasail together depending on the total weight and the wind conditions. You can take waterproof cameras with you and secure them around your neck. A picture of Bermuda from high above can be worth a million. If your family members or friends are parsailing and you like to only watch them from the boat, you can also do that. On request and if there are vacancies, the operators also let you join them and watch the exciting parasailing activities from the boat. They operate from the dockyard and it's only 2-3 minutes walk from the Kings Wharf or Heritage Wharf where the cruise ships dock. They have secured harness type parasails. Their powerful winch boat called 'Thrill Seeker' can take up to 12 persons. You will take off and land on their boat. Two persons can fly together. However the total weight needs to be within 350lbs. You will be mostly gliding over the western end water area called Great Sound. The Parasailing tour is combined with a 30-minute sightseeing tour on water by boat showing you several attractions along the coastline... they may even take you to coral garden (a water area) full of colorful corals and marine life, or to the partially submerged shipwreck Vixen etc. KS Watersports does not have any scheduled tours. However you should book in advance during the high tourist season. They are open 7 Days a week from 9am - 6:30pm. 6 Dockyard Terrace, Royal Naval Dockyard (near Kings Wharf). KS Watersports is located at Bonefish Bar & Grill next to the Ferry Terminal. St. George's Parasail Water Sports Ltd.
You will take off from and land on the Krant Craft deck without getting wet. The deck can also be skimmed across the water. The parasail type is secured harness style and it operates on the beautiful St. Georges Harbor on the eastern end of the island. Capacity is 6 persons. They operate between May to October. Hours: 9am-6pm (Mon-Fri); 11am-5pm (Sat & Sun). They too offer parasailing at the western end of Bermuda from the Dockyard. They fly you over the north shore and Great Sound water area. Launching and retrieval are done from the deck of Skyrider that has a maximum capacity of 10 persons. The parasail type is sit down chair and two persons usually fly together. They operate between May to October. 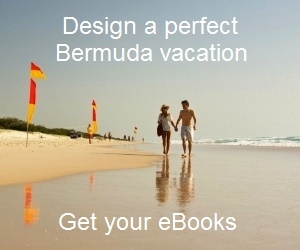 Hello, we will be in Bermuda in a couple of weeks and would like to Parasail. Can you tell me the rate for this. I just want to be prepared. Thank you. Hi, rate for Parasailing can vary between operators. KS Watersports charges $110 per person (they operate from the dockyard, i.e., Kings Wharf port location). They combine parasailing with a 30-minute sightseeing eco tour from water. On the double parasailing, what is the weight limit? Going on a cruise for my honeymoon and she wants to try it out together. Thanks. Usually the double weight limit is 325lbs. Hi, KS WaterSports and Skyrider Bermuda Ltd. are two companies that I know of who offer parasailing from the dockyard area. You will find the details above. Regards.